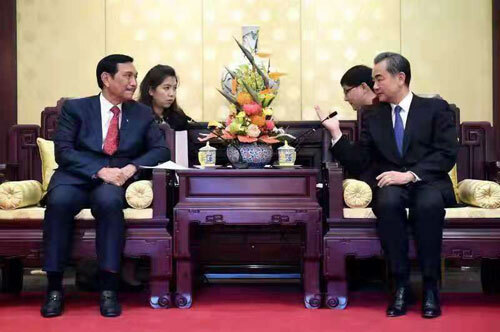 On October 24, 2018, State Councilor and Foreign Minister Wang Yi met in Beijing with Special Envoy of President and Coordinating Minister for Maritime Affairs Luhut Binsar Pandjaitan of Indonesia. 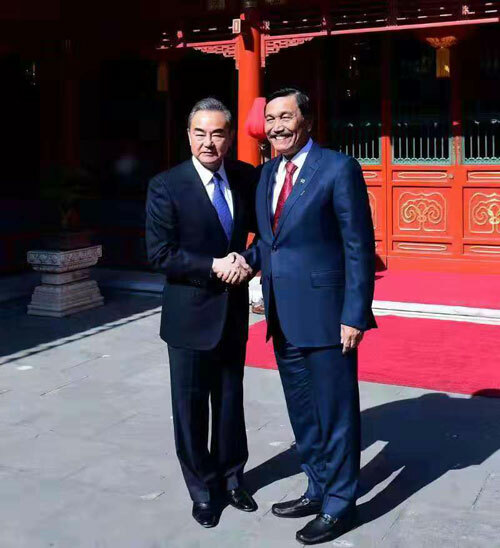 Wang Yi welcomed Luhut Binsar Pandjaitan to visit China as Special Envoy of President Joko Widodo again, and expressed that China and Indonesia are good brothers and good friends who have always understood, supported and helped each other. Both countries are major developing countries, emerging market economies and important Asian countries. The sound and stable development of China-Indonesia relations is not only conducive to both countries, but will also promote peace, stability and prosperity of the region and the world at large. The Chinese side is willing to, together with the Indonesian side, maintain close high-level exchanges and propel cooperation in various fields to promote bilateral relations for greater development. Wang Yi pointed out that China and Indonesia are natural cooperation partners in the joint building of the Belt and Road. The Chinese side is willing to continue to uphold the principles of extensive consultation, joint contribution and shared benefits as well as openness, transparency and inclusiveness, carry out integration of the joint building of the Belt and Road Initiative with the "Global Maritime Fulcrum" strategy with Indonesia, actively advance the development of Indonesia's Regional Comprehensive Economic Corridors, constantly tap into the cooperation potential and space, and fully implement the cooperation consensus reached by leaders of both countries, in a bid to realize more mutual benefit and win-win results. Appreciating the Chinese government's assistance to the earthquake in Indonesia and post-disaster reconstruction, Luhut Binsar Pandjaitan noted that Indonesia's relations with China has always been the privileged direction of Indonesia's foreign relations. Indonesia highly appreciates the positive progress both sides have achieved since the establishment of the comprehensive strategic partnership over the past five years. Indonesia stands ready to further intensify bilateral high-level exchanges, learn from China's experience in development and governance, and take the signing of cooperation documents on the joint building of the Belt and Road Initiative and the "Global Maritime Fulcrum" as well as the establishment of the joint committee of the Regional Comprehensive Economic Corridors between both sides as an opportunity to enhance cooperation in such fields as investment, industry, infrastructure, fishery and human resource, so as to realize common development and progress.